A tempting polar bear claw from our Arctic bakery. No bears were harmed in the making of this pastry! Topping my baking to-do list this winter were bear claws. There is something about the sweet almond filling that makes these a mainstay of bakery shops – or perhaps it’s their cool name. Jack and I usually pass on these confections because most bakeries prepare them with an overload of sweetness. In researching recipes, I found a plethora of styles, from giant grizzly-sized pastries smothered in sliced nuts to tiny paws with a perfectly manicured almond on the end of each claw, and everything in between. The recipe I settled on took a bit of time and effort. I wanted a medium-sized confection that emphasized not sweetness but almond flavor.The resulting pastry was superb – a little lighter than standard bakeshop fare and with a nicely balanced taste of almond. Place flour and butter in a medium bowl. Mix together using a pastry blender until well blended and butter pieces are no larger than kidney beans. In a large bowl, dissolve yeast in warm water. Let stand 5 minutes. Stir cream, salt, egg, and sugar into yeast mixture. Pour flour mixture into cream mixture. Stir with a rubber spatula until ingredients are just moistened. Place dough in plastic wrap and chill overnight in the refrigerator. Turn dough out onto lightly floured surface. Dust dough with flour. Roll out dough to 14 x 18 inch rectangle. Fold into thirds, making three layers. Roll out again. Fold into thirds once more and place back into refrigerator while you make the filling. Add all filling ingredients to bowl of a stand mixer. Mix on medium speed until all ingredients are well mixed and filling is smooth. On a lightly floured surface, roll the chilled dough to a 12 x 16 inch rectangle. Cut the dough in half, length-wise. Spread half of the filling down the middle of one piece of dough. Repeat with other piece of dough. Roll each dough rectangle jelly-roll style from the long side. Cut each long roll into 5 pieces. Cut three slits into each piece to make the toes. Place each pastry on a parchment-lined baking sheet, curving them slightly (to spread the toes). Allow pastries to rise in a warm place for about 20 minutes. They should puff up. Brush each pastry with beaten egg. 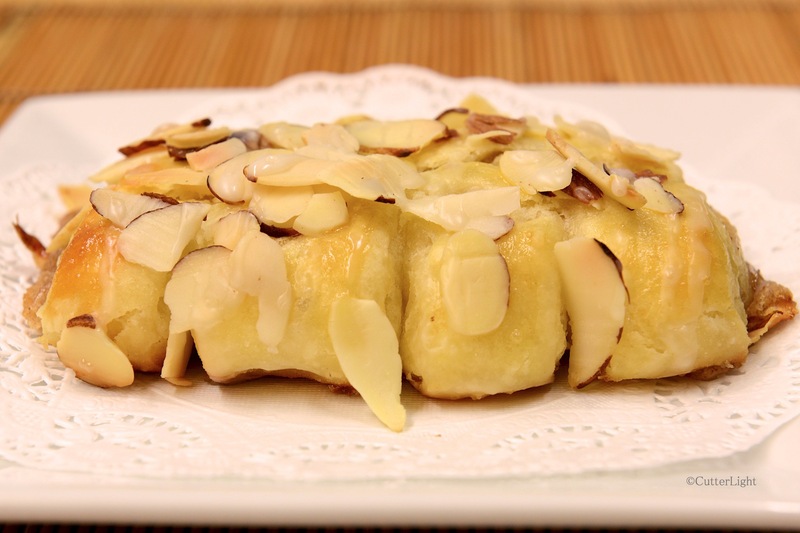 Generously sprinkle pastries with sliced almonds. Bake 12 minutes. Pastries should be lightly browned. Let cool slightly on wire rack. Drizzle with honey glaze. Stir together ingredients until smooth. Add more confectioners’ sugar if too thin, or add more milk if too thick. Drizzle over warm pastries. Thanks for the reblog as always! Let us know how yours come out. I’ve never seen this before, so cute! Glad you liked them! Thanks for reading and commenting. Those look great! I wish WordPress had a “Smell” option. I imagine that option is coming, but I want the flying cars we were promised first!